Architectural Laser Cut Products - Vista, CA |LaserFlow Products, Inc.
At Laser Flow, we create artistic designs in metal for homes and businesses. From artwork that adorns a wall to garden and gazebo screens and dividers and just about anything else. If you can imagine it, we can make it. With our new custom designed fiber laser, we can make affordable laser cut art work. 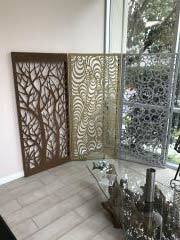 Go to our gallery to view a sampling of the architectural laser cut products we can provide for your home or business. Feel free to schedule an appointment to come by and visit our showroom at 2443 Cades Way, Suite 100, Vista, CA to see a wide range of patterns, colors and mounting options. Appointments can be scheduled by calling 760-738-8177. Our products can transform any area from ordinary to extraordinary. Choose one of our many patterns or create your own. We can work with both. For an original design, all we need is a digital file. Choosing the right material for your project is critical. Please review the material choices below before deciding. Aluminum- Aluminum is a lightweight material with a low density and is corrosion resistant. It can be used indoors or outdoors. Any aluminum item can be powder coated to a color of your choice. Carbon Steel- Carbon steel is durable and cost-effective but it susceptible to rusting. We suggest any carbon steel item be powder coated to a color of your choice, especially if exposed to the elements. Stainless Steel- Stainless steel does not rust, stain, or easily corrode. It is a perfect material for many purposes. Stainless can also be powder coated to any color of your choice. Corten Steel- Corten is a high strength steel which forms an attractive rusted appearance when exposed to the weather. Panels from this material are ideally suited for outdoor use. Corten material is not available in all sizes. Click here to view chart for available sizes. There are three primary mounting methods for our screens. We have developed these methods with ease of installation in mind. Our screens can be adjusted to work in nearly all applications, providing both beauty and strength to your outdoor project. A screen can be framed with wood or metal, like a picture frame or a wood door with a center piece insert. This is excellent for large partitions used for privacy or enclosures. LaserFlow ArtWorks® Integrated screen and frame design. This integrated design provides strength and flexibility to install. The screen and the frame are all part of the original sheet metal. This provides part integrity as well as flexibility while still retaining its artistic value. Each screen comes with key holes to hang as a picture, interconnecting holes to attach multiple screens together to form longer spans for fencing, or to enable installation to posts or cement blocks. Each corner is welded to provide strength and ground to a seamless finish. Click here to see the corner weld. The simplest method of installation is the direct frontal attachment. Holes are provided around the perimeter. A ½" up to a 1" standoff can be used for a nice visual effect. Pricing depends on several factors. They include the size of the screen, how it is mounted, what material is used, if it is painted or polished and the complexity of the pattern. The price for a standard pattern (15” x 30”) is as low as $199.50 in Corten steel, approximately 1/8” inch thick. The corten steel will change to a rust color over time, providing a weathered, rustic finish. It can be accelerated with a treatment of household ingredients. Large items (48” x 96”), made from 316 stainless steel will cost approximately $1,837.00. 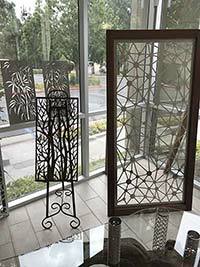 There is a spectrum of prices and designs to meet your requirements, with a nominal range of $650.00 to $1,200.00 for beautiful, long lasting metal screens. Also, we encourage custom design to your shapes and patterns. Please feel free to discuss your own design ideas or changes to our existing patterns. There is a nominal charge for custom art work. Please submit, your requests on our RFQ page and our artists will work with you. Leadtime is two weeks for stock items and up to four weeks for custom design. We ship using common carrier. We will provide you with the best price and prompt delivery. Tracking information will be provided if requested. Please inspect the container for any damage before accepting the shipment.